Sunday April 3rd 1881 It was bad walking today and not very pleasant so I did not go to church. I helped with the work all the forenoon, read after dinner and wrote a letter to Jennie in the evening. Mary Donovan came over this afternoon and wanted to wait till Thursday to begin the sewing. Monday April 4th 1881 I helped with the work in the forenoon and Mother and I went to town after dinner and got a new extension table. I made a few calls and a visit down to Eugene Harts. It was nearly dark when I got home. knit in the evening. Tuesday April 5th 1881 I was right at home all day. I made me two new white aprons and knit in the evening. 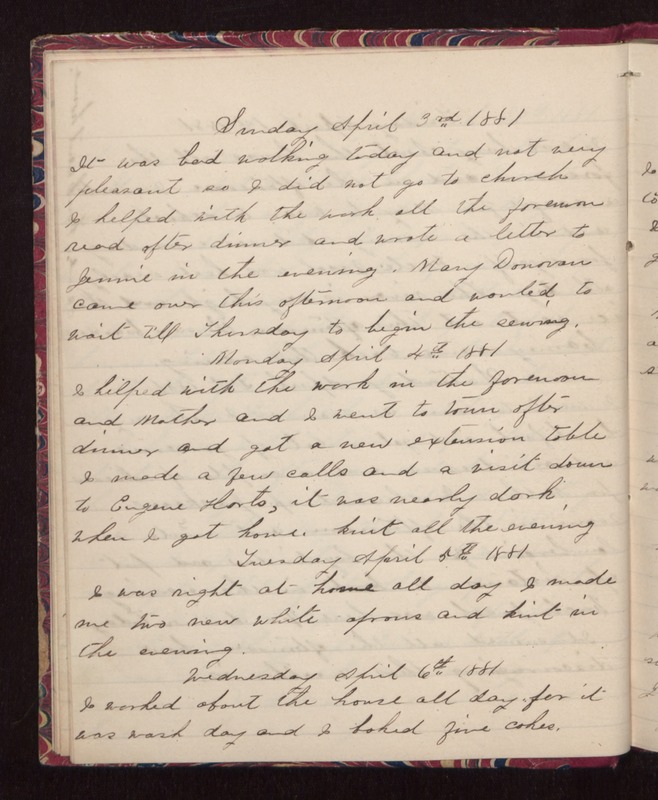 Wednesday April 6th 1881 I worked about the house all day for it was wash day and I baked five cakes.